When Kristin Rosenau of the moody, literary-minded blog thepastryaffair.com discovered her lactose intolerance, she had to get creative in her Bismarck kitchen. Turns out whipped coconut milk is an all-natural, dairy-free dead ringer for real whipped cream. The result: Desserts like Blueberry-Coconut Pavlova, a crispy-chewy pillow of meringue topped with whipped coconut milk and blueberry sauce. Not all coconut brands are created equally, though. Thai Kitchen coconut milk doesn't whip well, while Geisha brand works best for creating a solid, stable whipped cream. Place coconut milk in can in the back of the refrigerator for at least 8 hours, taking care not to disturb or shake the container. Let egg whites stand at room temperature for 30 minutes. Line a baking sheet with parchment paper. Trace around a 9-inch round pan on the paper. Flip paper over on the sheet; set aside. In a small bowl, combine 1 cup granulated sugar and 1 tablespoon cornstarch; set aside. Preheat oven to 250 degrees . In a large bowl, beat egg whites and cream of tartar with an electric mixer on medium speed about 1 minute, until soft peaks form (tips curl when beaters are lifted). Add the sugar mixture 1 tablespoon at a time, beating after each addition until sugar is dissolved (mixture feels smooth when rubbed between fingertips). Beat in 2 teaspoons vanilla. Continue beating on high speed for about 7 minutes or until stiff peaks form (tips stand straight). Spread meringue in circle on prepared parchment. Bake for 11/2 hours or until meringue appears dry and barely gains color. Turn off oven but leave door closed. Let meringue dry inside for 1 hour. Carefully remove meringue from paper. Transfer to a wire rack; cool completely. For blueberry sauce: In a medium saucepan, bring blueberries, the remaining 1/2 cup granulated sugar, the lemon juice and remaining 1 tablespoon cornstarch to boiling over medium heat. Simmer, uncovered, for 5 to 10 minutes or until thickened slightly. Remove from heat; stir in 1 teaspoon vanilla. Chill, covered, until ready to use. 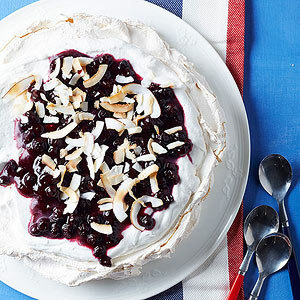 To serve: Using an offset spatula, spread the coconut whipped cream evenly over the top of the pavlova. Delicately spoon blueberry sauce over the top, leaving a cream border along the edge. Garnish with fresh mint leaves or toasted coconut. Serve immediately or within a few hours of assembling. To store, keep refrigerated. The pavlova will last 1 to 2 days.